The contrast in weather between yesterday and today couldn’t have been greater. Twenty four hours ago the wind was so strong it snapped inch-thick ropes, vaporized the tops of the waves and drove rain against our faces like needles. Yet today has been so clear and calm that one would think we were in an entirely different ocean. The crew came through the tempest without any injuries and the ship suffered no damage at all to the hull, rudders or deck. An inspection of the main mast, however, revealed a rather serious crack about half a meter above deck level. This seems to have happened early in the gale when the wind increased in intensity very suddenly and, just as suddenly, changed its direction. This forced the sail to “backwind,” putting great pressure on the mast and causing it to crack. 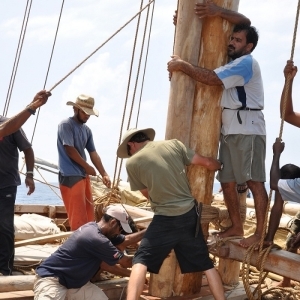 Fortunately, the Jewel of Muscat carries plenty of spare wood and rope, so at first light today the crew began the difficult task of reinforcing the damaged mast with a series of beams lashed tightly to the lower portion of the mast. The day was hot and humid and the ship was without shade, but the crew focused on completing the job in one day. By sunset, the rigging was re-attached and we hauled the storm sail up the main mast and rejoiced at being under way again. Just before the evening meal, Captain Saleh praised the crew for their hard work and gave special recognition to the carpenters and riggers for their tireless effort today. As I write this, we are sailing along at three knots. The Southern Cross is high in the sky–enabling our helmsman to steer confidently towards Sri Lanka.